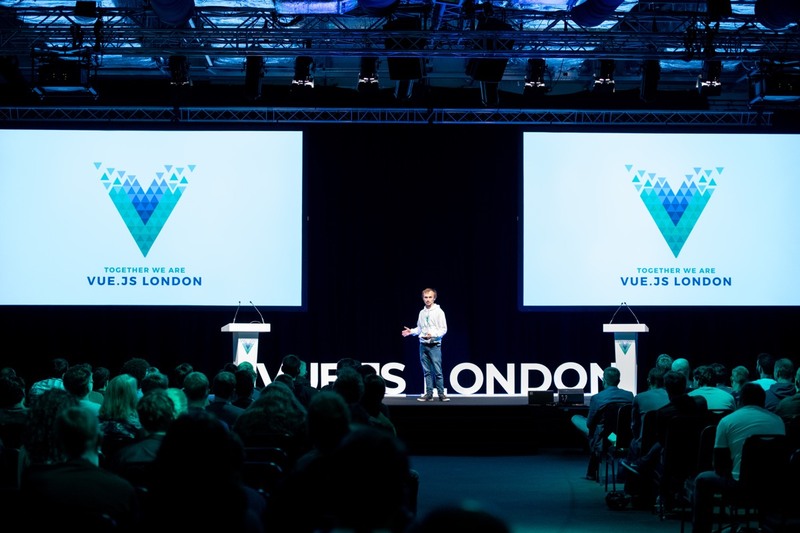 Last week I had the honour of being the MC at Vue London — London’s first Vue conference. 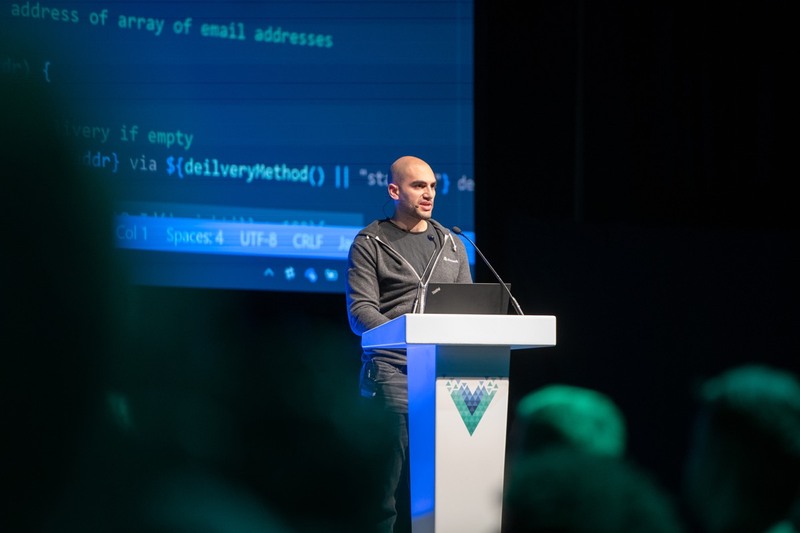 Like the framework itself, Vue conferences enjoy an amazing amount of support and enthusiasm from the development community. So I was excited to be involved in a way that would allow me to hear all of the presentations first hand and get into some great conversations around the event. 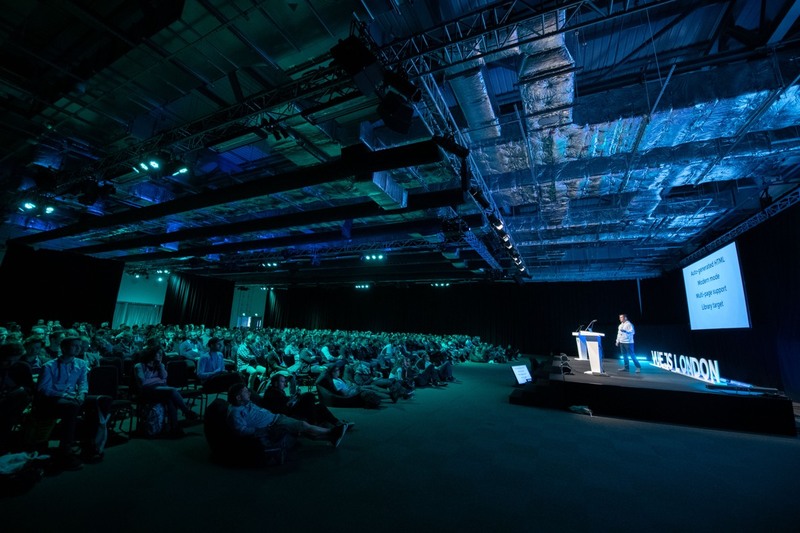 Although this was the first full conference for Vue in London, the organiser (Blake Newman, who did a fantastic job) chose to stage the event at a large and modern venue in the regenerated area of London which hosted the Olympics in 2012. There were a lot of seats to fill. The 650 seats (and about 20 deep, comfortable-looking beanbags which I eyed jealously from the stage) were almost entirely full and the atmosphere generated was great. Another reminder of the growing momentum Vue is experiencing. 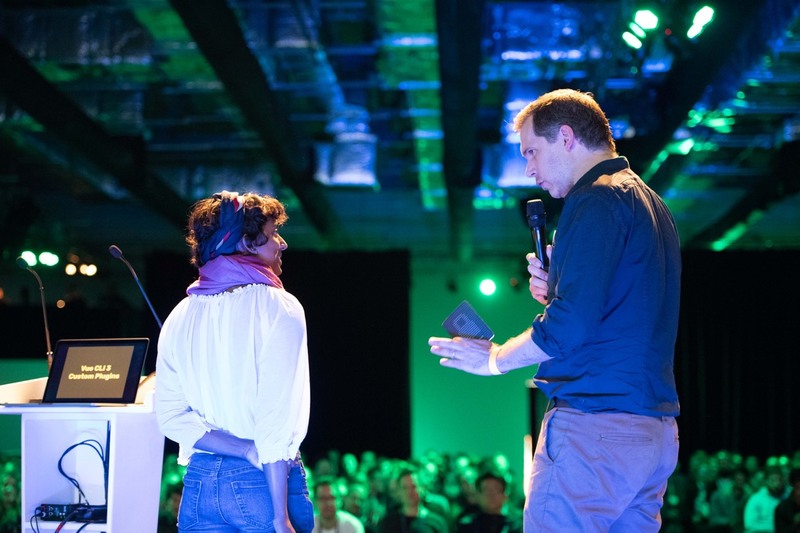 Prior to the conference day, there was an evening meet up and then a set of full day workshops. All of these were well attended and enthusiastically reviewed. Lots of content. Lots of expertise. Lots of people hungry to learn. 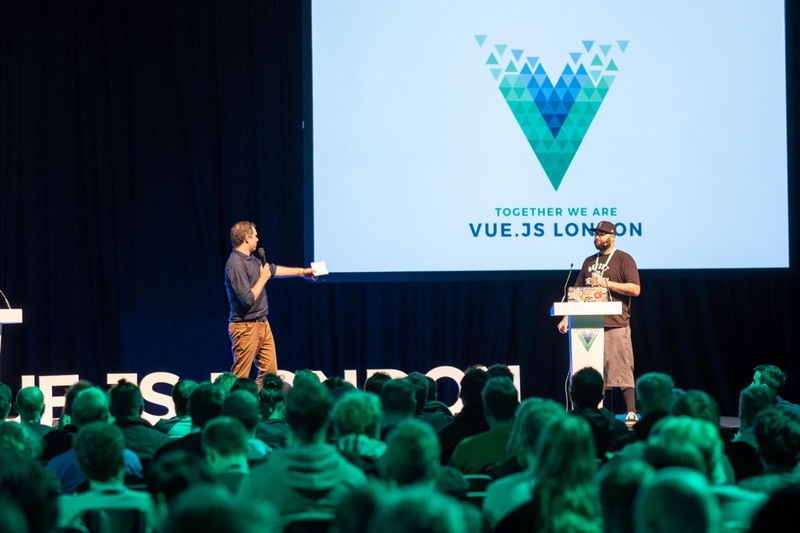 Gregg opened the day brilliantly, with a detailed, well-paced, and clear explanation on how Vue achieves reactivity in what it renders. His walkthrough of the code evolved steadily to reveal deeper concepts as he went. 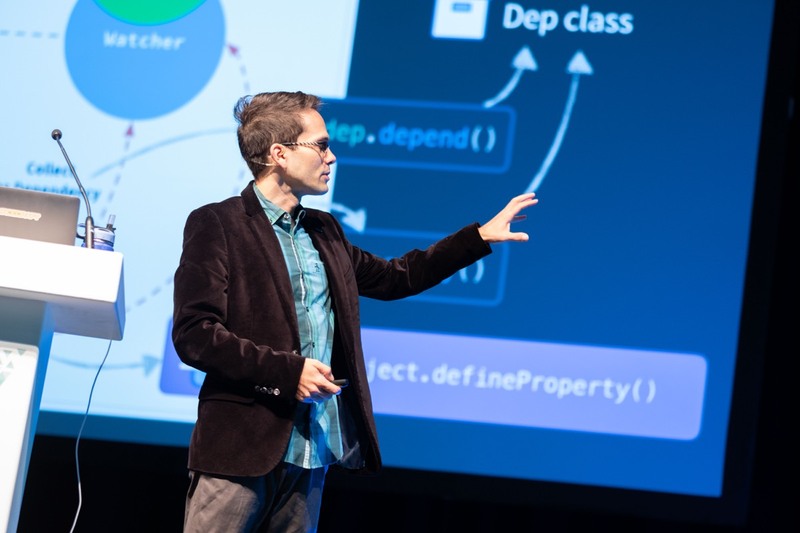 It’s no surprise that he founded Vue Mastery and teaches much of the content to be found there. An excellent tutor worth seeking out. Roman works at Codeship — a cloud-based CI/CD provider. If you’ve explored Netlify, you’ll know that we feel very strongly about automation and the value of continuous deployment, so I was excited to hear what Roman had to say. He delivered an excellent talk about testing in Vue. Describing tools like Jest and ways to make use of them with Vue’s unit testing library: vue-test-utils. Also discussing tactics for sensible mocking and other testing fundamentals. It was great to see this kind of practice getting good air time at the event. Most valuable. Sara provided a great change of pace to keep us all alert. Her trademark style of rapid fire delivery and casual irreverent content made everybody smile. Sara packs in an enormous amount of information when she presents. This time delving into using GraphQL and Apollo with Vue, and walking us through a practical example. As ever, her enthusiasm was infectious. Sebastien is one of the cofounders of Nuxt, the popular application framework built atop Vue which we’ve seen being used to great effect, pre-rendering sites deployed on Netlify. Not only did he deliver a state of the Next nation and report on the progress and direction of the framework, he also announced and the released Nuxt v2.0 live on stage. This was exciting to watch and it gave a great glimpse into the design decisions, principles and ambitions for Nuxt. Sebastien left me keen to explore and experiment more with Nuxt, which seems to have been very thoughtfully designed and implemented. As an engineer at GitLab, Jacob was able to share some of the details about how GitLab uses Vue in its site to help make manageable components. His focus however, was more on Vuex works for managing state, its history, and also how GitLab makes use of it. Interesting comparisons were made with Redux for reference. Jacob’s talk was another example of wonderfully paces technical explanations which balance detail and clarity. Another theme that I was delighted to see getting some attention at the event was accessibility. Chris was not the only one to talk about it, but his talk was specifically about accessibility and he spent time talking about a number of types of impairments that we should be mindful of (both permanent and temporary). He did a nice job of describing the importance of both designing and developing with accessibility in mind. And made the point that accessibility is not something you can add at the end of a project. It needs to be planned for from the outset, and made an important aspect of the delivery of projects. Data, insights and recommendations galore in this talk. Jen is the founder of Vue Vixens, an organisation who focus on helping people who identify as women to learn Vue. Beyond that, Vue Vixens help support many under-represented groups to learn development skills through workshops and meet ups. It’s an impressive organisation. 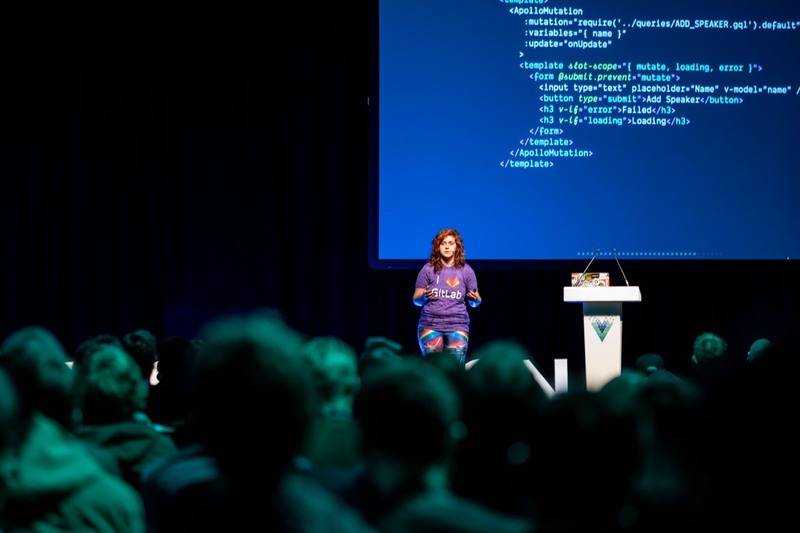 In her talk, Jen demonstrated the use of Vue beyond the web browser. Touching on subjects like machine learning, native device APIs and the use of NativeScript with Vue, we saw mobile applications developed with Vue which we truly native and not shoe-horned into a web view in an app. The various attempts to make native application development possible via web technologies over the past few years have left me rather underwhelmed, but the demonstration of NativeScript suggests a more interesting future for this approach. And being able to use Vue as part of that is an interesting prospect. 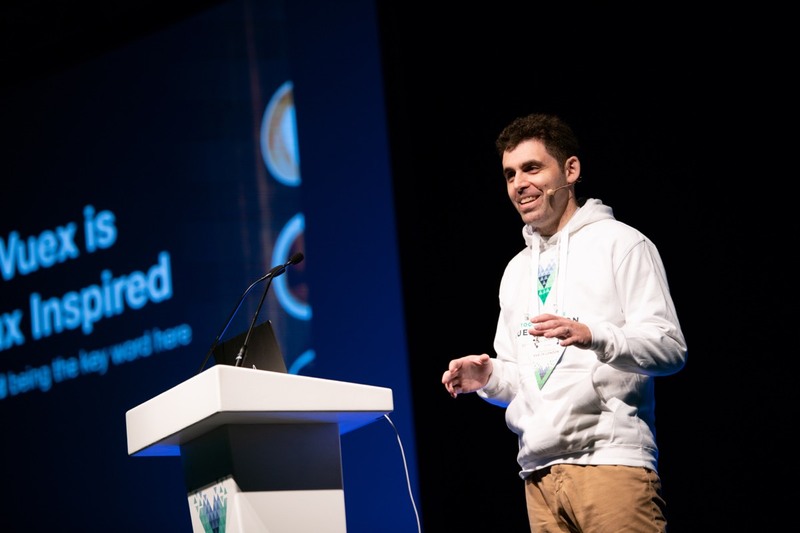 As a core team member and prolific open source contributor, Guillaume has a significant hand in both the Vue dev tools (which are, I think a big factor in the delightful developer experience possible with Vue) and also the Vue CLI. As version 3 of the Vue CLI was recently released, we got to learn lots about it. Both using it and how to extend it. It’s impressive and another useful gateway to ease developers into building with Vue. 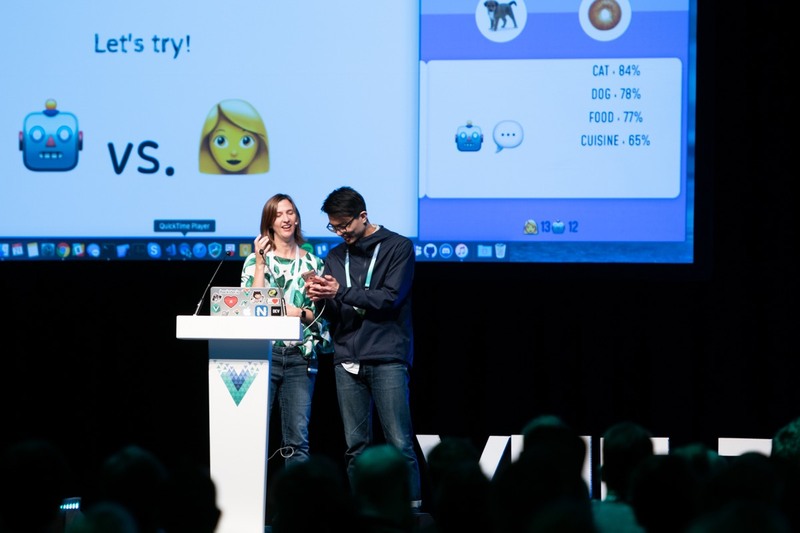 Combine that with the UI which helps to configure and visualize projects which Guillaume, of which also demonstrated new features, and it becomes clear that developer experience is important to the Vue community. And a good deal of effort in this area is really paying off. Daniel is Program Manager of TypesScript at Microsoft. To be totally honest, I had not previously given TypeScript much attention. As a result, as Daniel worked through his clear and well pitched set of demonstrations and examples, I found myself getting excited by what I was seeing. VS Code from Microsoft perfectly surfaces many of the productivity benefits of using TypeScript, and Daniel used it to show how nicely the two can reduce errors in code and help with readability and accuracy. TypeScript and Vue are becoming an increasingly common pairing. I find myself eager to explore it more. Since Evan, the creator of Vue, was busily on paternity leave, he couldn’t join us in person at the event. However he did still present a talk remotely which, thanks to the superb AV crew at the event, and Evan’s experience and deft hand at presentations, worked very well indeed. Evan laid out the plans and significant progress already made towards the next major release of Vue — version 3. This included a focus on size and performance. Internal architectural changes are yielding double the performance in the Vue runtime while also weighing in at half the size. For me, this was a great signal that Evan and others in the core Vue team are working hard to avoid the bloat that can drift in as frameworks get more popular and more powerful. In order to allow for better maintainability and ease contributions, the core of Vue is being made to be more modular. By breaking it up into standalone packages and adopting a monorepo structure the next version of Vue core will be less that 10kb when gzipped. The clever tooling will allow just the necessary modules to be included at build time. The Netlify CMS team moved to this kind of monorepo architecture when that reached v2.0. I think it’s a smart move. The announcement of a custom render API was the cause for some excitement. Introducing the possibility that Vue could be efficiently used to build for targets beyond the web browser. NativeScript, Weex and WeChat cited as interesting candidates. I really enjoyed hearing Evan talk about not only about what was being planned for the future, but also how it was being planned. 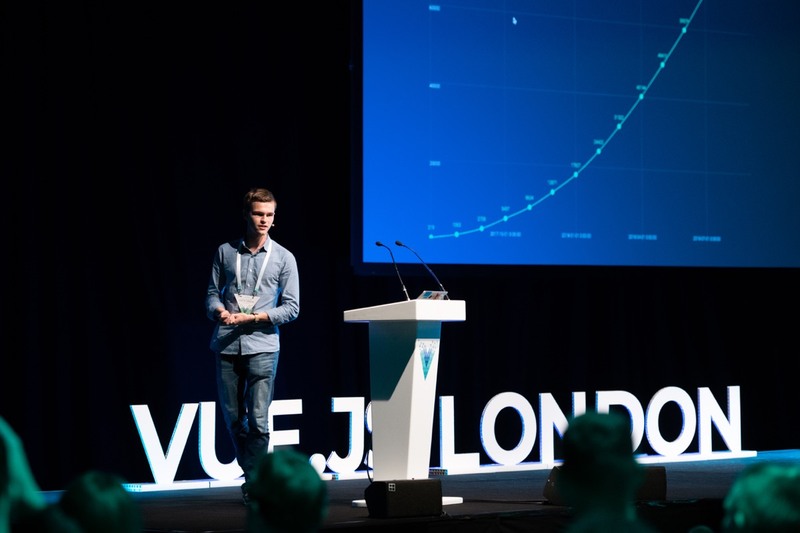 It was clear that he has a great engagement with the core team and the wider community, and that the direction of Vue is carefully balanced between demand from the community, and careful, thoughtful curation from the core team. In addition to the full length talks, we also got a number of 7 minute lightening talks after lunch. These helped to keep the pace moving along nicely. 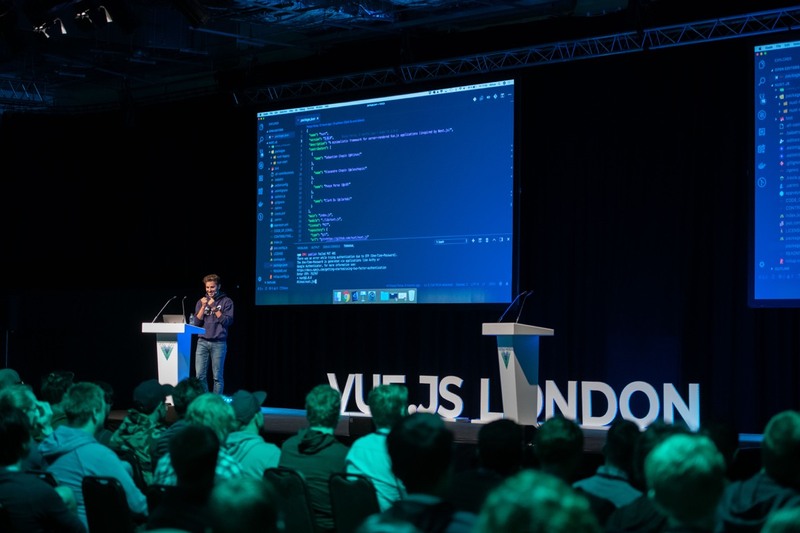 Netlify’s own Divya Sasidharan gave a talk about extending the Vue CLI via plugins, including reference to a Netlify plugin to simplify the development of serverless functions as part of Vue projects. We also heard about data visualisation in Vue. The work being done my the Vue Vixens organisation. We saw live demos of building with VuePress. Learnt about how Vue manages event handling. 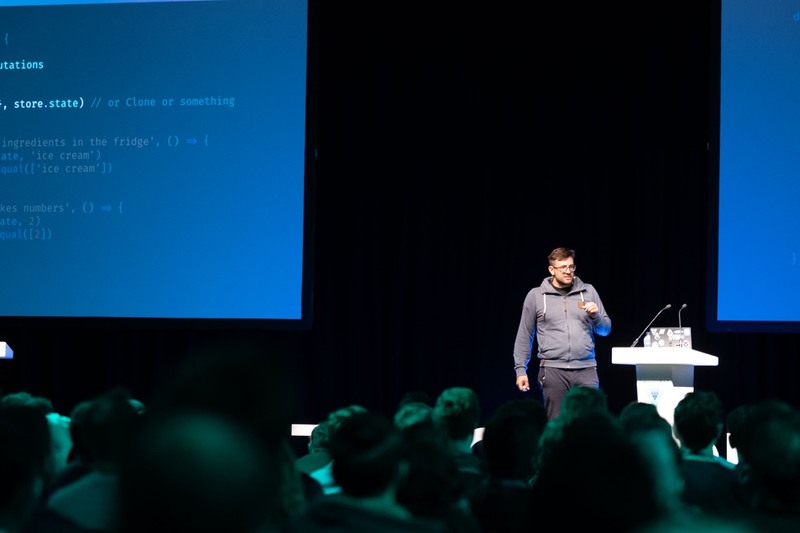 And to cap it all we got an amazing demonstration of the coming updates to Codesandbox from Ives van Hoorne, where he showed us how this client-side, browser-based IDE will soon be able to run server side logic through something called Server Side Bundling. This is something to look out for. Especially for those wanting to quickly bootstrap a JAMstack project and run their builds right in Codesandbox during development work. Likely to be a potent combination when used with Netlify. Sometime in the future, the videos of these talks will be published. And they will be well worth your time. It’s fascinating to see Vue continue to grow momentum in the community. Its adoption is swelling, and there are a number of events such as this one being run around the world. Vue is far from the only framework out there. But it seems to be learning from the strengths and weaknesses observed in some of the others. As you can see, it was a full day. Undeterred by the effort required to make an event of this type such a success, Blake eagerly announced that the event would return in 2019.